LET US PREFACE THIS POST: Be sure to iron your fabric with spray starch before cutting AND make sure your seams are truly 1/4". If not, your quilt will not measure up correctly. If you are a beginning quilter, check the position of your needle and make a note of where you set it so all seams will measure correctly. The pattern given uses 1/4 inch seams, the measurements are for CUTTING fabric, which includes seam allowance. But when it comes to my quilts, I've become a fabric snob, you can definitely feel the difference from joanns fabric and the overpriced fabric at the quilt store (OK maybe it's not overpriced, but I spend A LOT of money there!). This quilt happened when my mom was in town and I needed to make a baby quilt ASAP since I would soon be going out of town as well. I knew I wanted this design since I saw it on pinterest (love the pinterest, I'm trying to get them to hire me as a professional pin tester). I knew that I needed 7 strips of fabric and some white. Shouldn't be too hard right! Unless you're me and you're very picky about what you buy. I found a couple cute prints and settled on the elephants since they're super adorable! Plus I love the grey with blue, orange, and green. I wanted stripes and polka dots, but that was proving to be challenging at joanns. They are (or were) quite limited on the stripe/polka dot selection. I finally decided on 6 other fabrics, and got 1/4 yard of each, except the green, I got a little extra since I knew I wanted it for binding. Then I grabbed some off-white... it had little vines of flowers or something in the print, but once I had the batting and back on, I couldn't even tell. My mom and I put it together in about and hour, and then we machine quilted it. I love machine quilting really small projects. Big projects.... That's another post for another day. This was easy since we just did lines, which is a look I really, really like. It's simple, cute, and best of all, I didn't have to pay to have this quilted!!! Binding on, washed and dried, and we had a SUPER CUTE & SIMPLE baby quilt! Oh I should mention that I did NOT use a pattern for this. I started quilting about 13 months ago, and after about 3 quilts I stopped buying patterns. YES it is a lot harder to have to think about measurements, and seams, and how much fabric needed. This pattern might not be perfect since my mom and I just kind of figured it out, but here are the measurements. I ended up being in love with this quilt (even with joanns fabric) and this is a pattern I would definitely use again! I have seen many versions of this quilt, if you use this pattern to make one, I would LOVE to see it! I love how quilters can take a pattern, but turn it into something completely unique and their own! Please post any pics! Can you share the designer of this fabric? Thank you SO much for your post and sharing your pattern! I just started quilting and have been trying to find an easy pattern for a baby gift I want to make. Once I'm done, I'll send you a picture! We would love to see anything you make! This pattern is so adorable for any fabric. Good luck! I had been saving my babies cute receiving blankets to make into a quilt I five in today using your pattern and those I made my first ever quilt! !I am not much of a sewer so this is quiet the feat for me I still need to sew the lines across it but it's done. Thank you so much for the lovely pattern. We LOVED your adorable baby quilt! Thank you so much for sharing! I think the size of the finished quilt is smaller than stated. The measurements shown have the seam allowances on them and seems that wasn't taken in to account when the size was calculated. I double checked the measurements, taking into account the seam allowance, and I am still getting 43 1/2 by 43 1/2. I'm not sure if you made this quilt using this pattern and it didn't add up, but if that's the case please keep in mind that all fabric stretches and moves, which may add or take away from the final size. *please also make sure to read through all the instructions as there is a slight error on the drawing, I am in the process of fixing that right now. Thanks for keeping me on my toes, sometimes all the math involved in quilting makes my brain hurt! I hope this helps. The pattern has been updated. The drawing should now be correct match up with the correct measurements. Hi Ray. I made a variation of this quilt yesterday and my long white strips came out an inch too short and I had to re-cut them (no problem I had plenty of fabric). Your pattern has them at 43.5 - I ended up adding an inch. Based on bitter experience, I find it's always best to over-estimate, especially accounting for a bit of stretch here and there. Those 4 white strips of 43.5 should actually be 44.5. The one 41.5 x 6.5 vertical strip should be 42.5 x 6.5. Anyway, thanks so very much for sharing!! Great pattern. If there was a way to post a picture here I would post mine. I always use 1/4 inch seams on my quilting. Thanks for stopping by and for your question! Let me know if I can help you with anything else. Hi, I've been looking everywhere for the elephant splash fabric that you used, to make a newborn diaper. Do you know where I could find some? Hi Melissa, the fabric is from Joann's and I've never been able to find any of it since I made this quilt. I've looked for it online and in multiple store locations. I'm not sure they make it anymore. If I had scraps I would send them to you! Good luck in your search! Oh, good news, I found a link where, hopefully, you can order this fabric. Good luck and happy stitching! Copy and paste this link and it should work! Melissa, I found another link for ordering from Joann's on line. I am a total newbie to quilting, I have never made one, but I want to try this as a gift. Can you tell me what kind of batting I need and how you use it? Do you patchwork all the fabric together then sew the batting on in one sheet or is it piece by piece just like the pattern? Let me know if you have any more questions! Good luck! May I please ask why you prefer to use the polyester batting in baby quilts? What is the measurement suppose to be for the 4 vertical white strips? Your measurements say 40 1/2 but the drawing says 43 1/2. Hi, it should be 43 1/2 since that is the final quilt size. Thanks for pointing the error out on the written measurements, I'll fix that! Good luck! Hi! I'm new at quilting. Do you wash your fabric before or after your done? I always was my fabric before I sew clothing. I wasn't sure what is best for quilting. Welcome to the world of quilting! I personally do not wash my fabric, as it tends to stretch and move more once washed. The reason you must wash fabric prior to sewing clothes is because you don't want to make a garment (to size) and then have it shrink in the wash!!! If you don't wash your quilt fabric (I never have) the entire quilt may shrink slightly once washed. This is very slight and usually doesn't effect the overall size of the quilt too greatly. But I have also read and seen people who pre-wash all their fabric (could it be anymore confusing!!). I think the reasoning behind this is to ensure that the fabrics won't bleed when the quilt is washed for the first time. I usually don't worry about fabrics bleeding. All my fabric is 100% cotton and I've never had anything bleed before. I think it's really personal preference (unless you're worried about bleeding color, or if you're using multiple types of fabric and you want everything pre-shrunk prior to quilting). Try it out both ways and see what works best for you. The general stretch of the fabric before it's washed causes me enough grief that I don't think I will ever pre-wash!!! Whew... That was a long winded answer!!! Good luck and let us know if you have any other questions!! Thank-you for your quick response! I'll try it with out washing. I can imagine it would be a lot easier to work with. I want to make a "real" quilt for my 3rd child due October 6th. So one less step will help! :) Thanks again! October is a great month for a baby! My son was born on the 14th! Congratulations, and we would love to see your beautiful finished quilt!!! How did you do your binding? Sorry if I'm asking too many questions. There's no such thing as too many questions! I don't have a binding tutorial, but I found one that is simple and I think it's great for beginners, check it out and hopefully it helps! That's exactly how I did mine. Thank you, we love compliments! You made a wonderful point and we appreciate your input...we are always learning and hopefully improving! Gosh, that turned out really cute! Is that a quilted owl design? It's Owldorable! Thanks. I was really happy with the way it came out. Yes it is an owl. We have a local shop, At the Heart of Quilting, that sells Gammill machines and rents machines by the hour. Right now I'm working on a couple more baby quilts using your pattern... one pink and gray and one teal, yellow, green, and orange with a mermaid print. I'll post the pictures when I get them finished. I fell in love with this quilt and decided to make one. I love how it came out. I wish I could figure out how to share the picture of it with your readers. Your pattern is so easy, but one that young mother's will really like. Simple but cute. Jackie, we would love to see your finished quilt! You can send me a photo via email, rizupan@gmail.com, and I will post it for all our readers to see. I'm so happy the pattern worked for you! It's definitely a classic! Good luck with all your future quilting! All questions matter! Especially for first timers, sometimes it's a little overwhelming to know where to start. If you've got everything cut out I would recommend beginning by sewing the white pieces onto the colored/patterned. For example, sewing a 1 1/2 x 6 1/2 inch white piece to the top and bottom of each 6 1/2 x 6 1/2 inch colored/patterned block. If your fabric is directional (like my elephants are) make sure you're sewing the white strips onto the top and bottom, not on the left and right. Then I would do the same for my larger strips. Sewing the 1 1/2 x 27 1/2 inch white strips to the top and bottom of your patterned/colored 6 1/2 x 27 1/2 inch strips. And again for the vertical strip, sew the remaining two 1 1/2 x 6 1/2 inch strips to the top and bottom of the 6 1/2 x 41 1/2 inch vertical. All you'll have left to do is sew the 1 1/2 x 43 1/2 inch white strips to the left and right of the vertical strip and onto the left and right ends of the quilt! Hopefully that makes sense or gives you an idea.. Let me know if you have anymore questions, and good luck!! I can't wait to see how it turns out! I love your quilt and think it would be the perfect first quilt attempt for me. My son is turning two and I would love to make it for him for his big boy bed. Any suggestions on how to scale up the quilt to a twin bed size and then determine the yardages I will need for my different fabrics? Thanks for your help and your beautiful quilt! 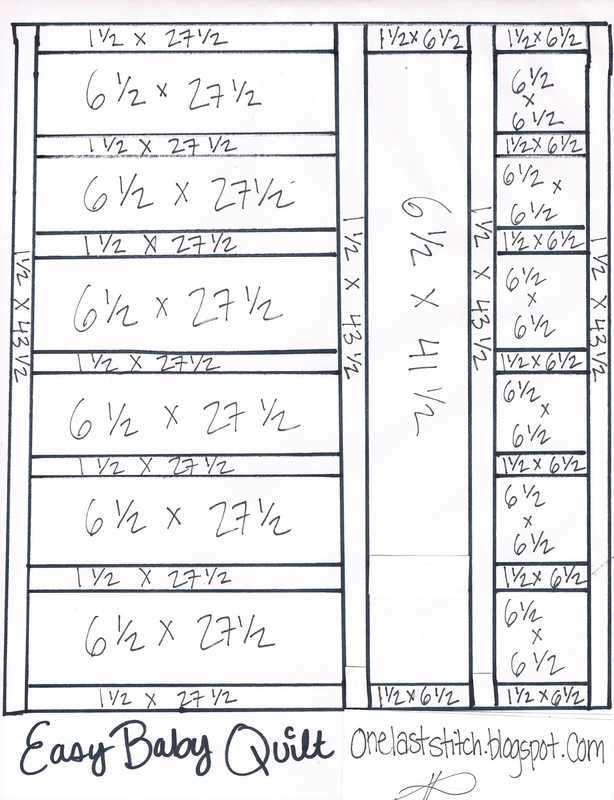 Hi Unknown, So, I drew a sketch of a twin bed quilt with measurements of 66" wide by 88" long. I did make strips wider thinking it might look a little better for a larger quilt. For the eight horizontal strips (I added a couple because of increase in length) 1/4 yard each. You won't have extra for error so if you are worried about mistakes (I'm the queen of messing up) buy 1/2 yard of each. For the vertical strip 1/2 yard. *You'll have to piece this strip so you'll cut two pieces 8 1/2" wide and then sew together. Change 1 1/2 x 27 1/2 to 4 1/2 x 28 1/2"
Change 1 1/2 x 43 1/2 to 4 1/2 x 88 1/2"
Change 6 1/2 x 43 1/2 to 8 1/2 x 80 1/2"
Change 6 1/2 x 6 1/2 to 8 1/2 x 14 1/2"
Change 1 1/2 x 6 1/2 to 4 1/2 x 14 1/2"
I hope this is helpful...I always draw a picture on graph paper before buying/cutting fabric. I know there are quilt design programs out there, but, for some reason I enjoy drawing it out myself. Let us know how it works out for you and please feel free to ask more questions. I think I'd like to try and quilt it like yours (this is my 3rd quilt). what's the spacing between the quilt lines? it looks to be about 2.5 to 3 inches? Hi Tiffany, the lines are spaced 2 inches apart except on the white sashing, that was done using the stitch in the ditch method (the ditch being the seam). Hope that makes sense. Straight line quilting always looks so clean and modern! Good luck! I've been wanting to try out your pattern for about a year, and I finally got the chance. I didn't realize I'd only cut 5 rows, so it's a bit smaller but I really like how it turned out. Can you maybe help me with my comment below on measurements? I hope to get a response as I'd like to start this today..but what measurements do I follow? I added up the measurements from the sketch and they 46.5 horizontally and 49.5 going vertical...the vertical white strips are only 43.5 long..it doesn't add up? The finished quilt should be about 43 1/2 by 43 1/2. 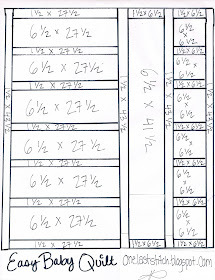 The measurements on the sketch are to use when cutting fabric. The quilt was made with a 1/4 inch seam allowance. If you make your seams larger or smaller, it will alter the finished size of the quilt. The vertical white strips are only 43 1/2 because that is the size of the finished quilt, and they're not losing any length from a seam. The other pieces will be sewn together using 1/4 seams, and will equal 43 1/2 once sewn together. Can I ask what would happen if I used more than a quarter inch seam allowance? Hi Inga, If you use bigger seams it will change the size of your quilt; it will end up being smaller. That's not a problem as long as you make sure all your seams are the same size. (Accuracy in seam allowance is imperative). If you are a beginner, it's always better to have a little extra fabric, just in case. Thanks for your question. Thank you for sharing this. The tip about drawing out the design helped me finish a quilt in no time! Lisa, glad this helped you, thanks for visiting our blog! Would love a picture....Merry Christmas to you too! Hi... Your quilt pattern is so cute. Before I give it a try, I'd just like to clarify a few of the measurements. In the picture, the white borders look even all the way around; even next to the binding. It would seem that the white borders around the perimeter of the quilt would have to be cut wider to allow for the seam allowance for the green binding. Also, will you pls give the measurements for cutting the binding? Looking forward to making this =) Thank you!!! So sorry for the delayed response! All of the white borders take into account a 1/4 seam allowance, which includes the edges for binding. I cut my binding at 2 1/2 inches, fold it in half and use 1/4 inch seam allowance when attaching it. I LOVE this pattern and cant wait to make it. Im a beginner to sewing and quilting do you have any tips for a beginner? I cant wait to get started. For beginners we always recommended measuring twice (or three times!). Actually that's always a good rule to follow! Make sure you use your iron, it's a lot easier to sew when your fabric is pressed and your seams are nice. Find a place you can lay everything out to get an idea of the finished project (I like to take a picture with my phone for reference). Don't forget to pin! Your quilt will look better if your fabric is lined up nicely (you can watch YouTube videos for lining up seams, it really makes a difference in the end result). The seam ripper will become your best friend and worst enemy, but we all have to unpick. It happens. Lastly, don't forget to have fun, turn on some music, grab some snacks, and get creating. Please share your finished quilt 😘 Good luck! Thank you for the great tips ill make sure i use them. I cant wait to start my first quilt. Ill make sure that i take pictures and share. This is very exciting!! We look forward to viewing your finished product....happy sewing! Hi! I'm keen to try this for full/queen...any thoughts? I have loved this pattern since I laid my eyes on it months ago! I think it would look AMAZING!!! It shouldn’t be too difficult to make larger. Make sure you send pictures of you make it! I just finished cutting out all the pieces for the front, and I find myself wondering how you did the binding. Am I just blonde and missed the assembly instructions? Lol. If so sorry, I can get the front put together no problem but bindings always perplex me. How did you do this one? No worries, and so sorry, holidays always put me behind schedule. For binding, I always cut it 2 1/2" wide by perimeter of the quilt, plus about 10 extra inches. Sew strips together, and then iron it in half so it is double thickness. Stitch it around quilt using 1/4 seam. I always sew it down on the top side of the quilt if I'm going to hand-stitch the back. If you want to machine stitch it down, then sew it down on the back, iron and then machine sew it down on the front.